NOVI, Mich. (March 21, 2018) – Barbecue, whiskey and music fans rejoice! 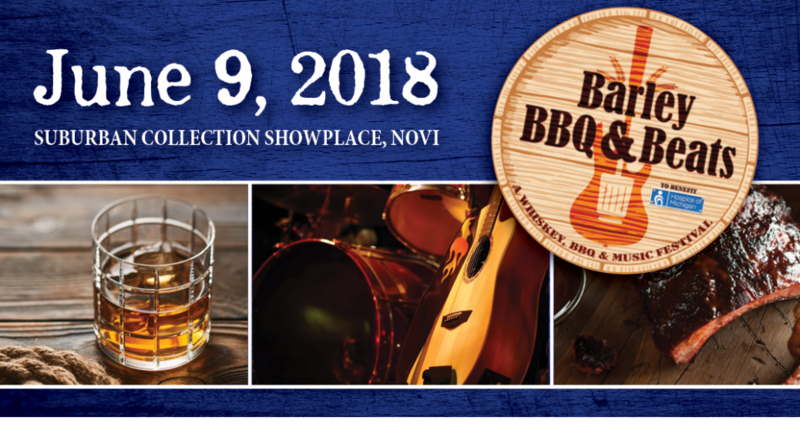 Hospice of Michigan will host Barley, BBQ & Beats from 5 to 9 p.m. on Saturday, June 9 at the Suburban Collection Showcase in Novi. Tickets are $40 in advance and are available at www.hom.org/BBB2018. The festival-like fundraiser will feature a large variety of food and drink vendors, live musical entertainment and a lawn games area in support of Hospice of Michigan’s Open Access Fund, which provides end-of-life care to patients regardless of age, diagnosis or ability to pay. With each admission, guests can enjoy three BBQ servings and three hand-crafted cocktail tastings. Additional tasting tokens will be available for purchase at the event. Gluten, dairy-free and vegan selections will also be available. Guests will be entertained by an array of southeast Michigan’s best live music to dance the night away including performances by Corey Dakota & the Rippers, Drop 3rd Strike and Space Cat. Southeastern Michigan’s Barley, BBQ & Beats is patterned after a successful event by the same name in Grand Rapids, which raises funds for Hospice of Michigan services in the western part of the state. The 3rd annual Grand Rapids Barley, BBQ and Beats is slated for May 19 at Van Andel Arena. Guests will also be invited to pay tribute to a deceased loved one by posting a photo or sharing a memory in a specially designated area. Visit www.hom.org/BBB2018 for Barley, BBQ & Beats tickets or for more information. Event sponsors include: Carelinc Medical Equipment and Supply and Meijer – Smokehouse Sponsors; ABG Michigan and Learning to Give (The Meijer Foundation) – Barley Sponsors; RCO Engineering – Backyard BBQ Sponsor; Hour Media – media sponsor. To secure sponsorship, please contact rkiesling@HOM.org or 616-356-5229. Additional event sponsorships are available by contacting Kim Streich at kstreich@hom.org or 734-794-5120.